Looking for a gift for your MapleStory Mesos hunter buddies? Why not check out the items available now from the MapleStory Cash Shop. Check out the holiday themed pets available for Maplers. You can also get MapleStory items and covers for your friends. The Crystal Rudolph pet is available at the Cash Shop from December 17 to December 25. This pet comes in a package selling for 13,935 NX. The package includes Cyrstal Rudolph and Crystal Rudolph Wings. Additional items in the bundle include six pieces Premium Pet Food to feed your cute pet. You can also name your pet with a Pet Name Tag. Other items added to the package include Auto HP Potion Skill, Auto All Cure Skill, 2 Scroll for Pet Equip. for ATT 60 % and 2 Scroll for Pet Equip. for M.ATT 60%. Maplers can also hunt items and mesos along with an adorable Snowman pet. This pet is selling for 13,935 NX in the Cash Shop from December 17 to December 23. Buying the package will get you the Snowman pet and its Snowman Gear. You can also name your pet with the Pet Name Tag included in the pack. Make sure to feed your snowy friend with Premium Pet Food (6 pieces). The package also includes Auto HP Potion Skill, Auto All Cure Skill, 2 Scroll for Pet Equip. for ATT 60 % and 2 Scroll for Pet Equip. for M.ATT 60%. From December 17 to December 25 Maplers can get Christmas themed Permanent Equipment Covers from the Cash Shop. This is the perfect time to get them as they will be marked down significantly. Get Christmas Light Hairband, Christmas Bell and Christmas Wreath for just 2,500 NX. Dress your character in and Elf Hat with matching Elf Overall for 2,500 NX per item. For a full list of items check the Cash Shop announcement here. The Shining Star update for MapleStory adds the Star World dungeon for Maplers to get MapleStory Mesos and MapleStory items in. The dungeon features quests and special loot for those who participate. We’ll go through the basics of this dungeon and what prizes await those who journey to the stars. The Star World dungeon is open to characters level 30 and above. Maplers can visit the dungeon anytime between December 3 and January 6. To get to the dungeon, players simply need to accept the quest [Star World] Doorway to the Night Sky available from the star notifier on the left of the game window. Your character will be then teleported to the event hall where you can access the Star World Gate to enter the dungeon. Star World itself is divided into four different nations. These are the Springtean, Summeron, Autmist and Winterisia. Visitors to these star nations can accept quests from the kings and queens of these nations. Completing these constellation quests will reward Maplers with Star World Coins. Note that as more quests are completed, more items can be bought at Stellar’s Star Light Shop. Star World Gift Boxes can also be obtained through daily quests and from killing monsters in the area. 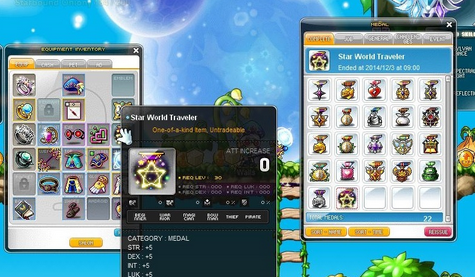 Star World Coins can be exchanged at Stellar’s Star Light Coin Shop for nifty items. Maplers can get Constellation Chairs, and a Night Sky Damage Skin. Those who want to prove that they have gone to Star World can also purchase a Star World Traveler Medal. Those who open Star World Gift Boxes can obtain a random item. Many items can be received this way including but not limited to Trait items, Restorative items Cubic Blades and even more Star World Coins. MapleStory players can get a Gingerbready pet to help them hunt MapleStory items. The Cash Shop will have the pet available along with sacks of MapleStory Mesos. Cash item collectors can also get random gifts to add to their collection through the Holiday Surprise boxes. From December 3 to December 9, Maplers can get themselves a Gingerbready pet from the MapleStory Cash Shop. The Gingerbready Pet Package goes for 13,935 NX. Players who buy the package will get the Gingerbready pet along with his Gingerbread Bow Tie. The package also includes, six Premium Pet Food, Auto HP Potion Skill, Auto All Cure Skill, Pet Name Tag, 2 Scrolls of Pet. Equip. for ATT 60% and M.ATT 60%. Note that the pet and the bow tie are both permanent. With the new Star Force enhancement system, demand for MapleStory Mesos is rising. Thankfully, from December 3 to January 20, players can buy Meso Packs from the Cash Shop. When opened, these will give players millions of mesos. Rare Meso Packs sell for 1,000 NX and can give two million mesos and up, including a chance to get 54 million mesos. The Epic Meso Pack goes for 2,000 NX with contents going from 4 to 208 million mesos. Lastly, the Unique Meso Pack gives buyers anywhere from 6 to 750 million mesos. The holidays are here and MapleStory is helping Maplers celebrate with Holiday Surprise boxes. Starting December 3 and ending on December 30, players can get Small and Large Holiday Surprise boxes. Opening the boxes will reward players with random Cash Items. The item will have a value equal or more than the value of the box that gives it. Small Holiday Surprise boxes go for 1,000 NX each, and 10,000 NX for a bundle of 11. The Large Holiday Surprise boxes meanwhile sell for 3,000 NX a piece, with the bundle of 11 going for 30,000 NX. The MapleStory Cash Shop has another update for collectors of MapleStory items! Maplers can now hunt MapleStory Mesos with a Turkey Pet or while wearing new Styles. Players can also take their characters back to school with Sengoku High Entry Passes. Starting November 20, Players can avail of new Styles from the Premium Surprise Style Box. Available Styles include Magic Star Suit, Mystic Black Silk Hat, Magic Star Dress, Mystic Black Silk Ribbon, Dark Cygnus’ Hairband, Dark Hawkeye, Funny Punch Yo-yo and many more. Each Premium Surprise Style Box sells for 3,400 NX. Buy a bundle of 11 however and you can get it for just 34,000 NX. Note however that each box gives its contents randomly. Styles can be exchanged with other Maplers through the Cash Item Trade. Maplers can send their characters back to Red Leaf High and take on Oda Nobunaga again Sengoku style! Entry in the highschool however can only be done once a day however unless you have a Sengoku High Entry Pass. From November 19 to December 2, you can buy passes for 400 NX each from the Cash Shop. Bundles of 11 can also be bought for 4,000 NX. Get your passes now and earn items and mesos in this special dungeon. Halloween has come and gone, but that doesn’t mean all the spooky MapleStory items need to go! The MapleStory Cash Shop still has scary and creepy items up for sale for the MapleStory Mesos hunter. Get Damage skins and Cygnus Knight items. Halloween themed Equipment Covers are also on sale! From October 29 until November 4, players can purchase Halloween themed Permanent Equipment Covers. The items can be bought from the Limited Time Specials category of the Cash Shop’s Special Promotions section. Players can give their male characters costumes such as Napoleon Uniform, Napoleon Shoes, Napoleon Cape and Napoleon Hat. Female characters can wear Witch Hat, Witch Clothes and Witch’s Broomstick. For a full list of available covers, click here. Note that the covers have been discounted so you can save your NX while dressing up your characters. Available after the October 29 game update, various Damage Skins can be obtained from the Damage Skin Random Box. The box is available for purchase in the Cash Shop in the New Arrivals category. You better act fast as they’ll only be only sale from October 29 to November 4. Get a change to get Blood Damage Skin, Zombie Damage Skin, Wicked Witch Damage Skin, Super Spooky Damage Skin, Jack o’ Lantern Damage Skin, Violetta’s Charming Damage Skin and Dragon’s Fire Damage Skin from the boxes. Each box sells for 1,000 NX. Players with a Cygnus Knight can also get items for their character from October 29 until November 4. All items are permanent, and best of all, are discounted. Get a Stealth Suit for just 6,000 NX. Take your pick from Mni Night Walker, Mini Dawn Warrior, Mini Wind Archer and Mini Thunder Breaker, each available for 6,000 NX. The Cygnus Effect is also available for the low price of 4,000 NX.